In days of old this would have been Ascension Thursday but since we began celebrating feasts on Sundays, this is just another day in the run up to the feast. But again Jesus is preparing the apostles for his leaving them. The gospel today is from the farewell discourse of Holy Thursday night but applies equally to this time. Jesus says he is going away for a short while and will return. Of course the apostles are confused and do not understand. Then Jesus tells them that while they are sad the world shall rejoice. That appears to be the way with the world, that sense of triumph when God or Jesus is taken out of society. We all see that hatred of God when we hear on the radio those who cannot hide their contempt for religion and belief. Jesus also experienced this but he let it go and talked to those who wanted to listen to him. We live in a world that hates Jesus. We should not react to them and argue, we should simply do what Jesus does, and we should love them and let them be. It is not our job to convert; it is our job to proclaim Jesus and pray. The time is coming for Jesus to leave and he is preparing his disciples for the coming of the Spirit. 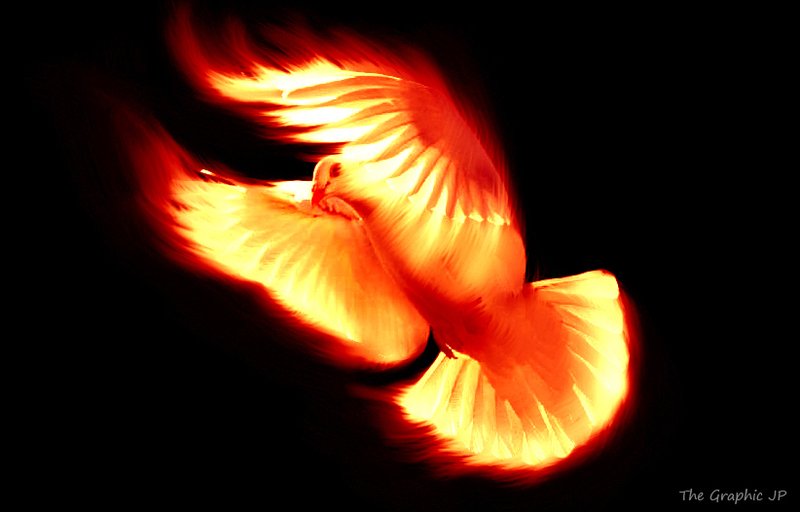 We should all be aware of this; the infusion of the Spirit at Pentecost is an act of God that changes our lives. Once we have received the Spirit of God our lives should change and we come to know God in a more intimate way. In her wisdom, the Church gives us the daily readings to lead us into the thoughts of the universal church for this particular time. Now we are supposed to be reflecting on the coming of the Spirit. Jesus tells us why this will happen—if he told us all that the Spirit teaches us it would be too much for us. This means that something special is about to happen to the apostles. The full truth of who Jesus is and what he taught is about to be revealed to them. There shall be no more doubt and unknowing; they shall be certain of what he meant. What a difference that shall make to their ability to teach. For us the Spirit shall increase one truth in us, that Jesus is Lord. All else stems from this and all leads back to this, the fact that we believe that Jesus is Lord of all. When we know this in our hearts the Spirit is within; then we cannot be shaken. at the feet of Paul and Silas." In today’s first reading we read where Paul and Silas receive a flogging at the hands of the authorities because they are causing turmoil among the people. This is the thing about the word of God: it always causes disturbance, first in the individual and then in the community. The nature of the Word is to challenge the world and the world and its servants don’t like this. Paul and Silas are thrown in prison. They are, so to speak, put out of circulation where they can do no harm. This is exactly the way the secularists want to treat the Church and anyone who believes in God today: put God in the prison of a person’s home but don’t dare bring him out into the community, God is a private God that you can talk to at home but don’t bring him into the public square. The earth shook, the prison doors opened and the chains fell off the prisoners. What did they do? Instead of running for freedom as you would expect, they sat in their cells and waited for the prison warden. What the writer is saying is that Paul and Silas are free, even in the prison cell. This is a big lesson for the poor old warden who is about to kill himself from fear: the prisoner is a freer man than him!! Today we have a short first reading but again we learn something interesting from the text; in those places where the Jews had no synagogues they gathered at some notable place on the Sabbath to pray. In this case the notable place was a river bank. This would have been unheard off in the Jewish world. Women had to stand outside the central prayer area of the synagogue and temple and were not considered worth preaching too. But the message of Christ is for everyone, male and female, Jew and gentile. The women were responsive to this new message that treated them as equals. They were as worthy of redemption as any man and they had the right to be baptised in the same way as the men. This was a new way of looking at God and women. Lydia is the woman mentioned in the reading as accepting the new teaching. In typical womanly fashion she said there and then that she was a believer and insisted that the apostles come and stay with her. The story of the spread of the church is ever widening. Now the apostles were preaching in Macedonia and even more, they were now going to places where they were preaching to women alone. The Jewish ways were definitely being left behind. The council of Jerusalem has come to an end and now the apostles are deciding how to send the new instructions out to Antioch. They elect men to travel with Paul and Barnabas. They chose two men, Judas and Silas, and gave them letters of introduction. The gentile converts at Antioch converts are given rather simple instructions on joining the new faith: abstain from food sacrificed to idols, from blood and not to eat the meat of strangled animals, and no fornication. There is to be none of the long list of Jewish Law with circumcision and all the Law’s rules to be imposed on the new converts. A new religion is being formed, which bypasses all the old Law and its rules. This is a big moment in the history of our church. The council of Jerusalem assumed the authority to interpret what the Holy Spirit was saying to the church. This was totally at odds with the Jewish way of understanding God. The Jews had the scriptures but believed that no one could fully understand what they meant or what God was doing in the world. This new group was claiming to know what the Spirit wanted and claiming the authority to speak out and say what the Spirit meant. These were decisive moments in the self understanding of the Church. As we come up to the feast of Pentecost we shall read a lot more about this work of the Spirit. During this run up to Pentecost, we are still celebrating the resurrection and to this end today’s reading is about the promise of what is to come. Jesus tells the apostles not to worry and to trust in him. He tells them that there are many rooms in his Father’s house and that they know the place where he is going. Confused, the apostles say that they don’t know the way to where he is going and Jesus replies that he is the Way. We are back to one of the essentials of our Catholic faith; our faith is a faith and a belief in a person. That person is Jesus, God and man, the word incarnate. The whole summary of the Christian life is coming to believe that Jesus is God. The more we grow in this belief the nearer we are to understanding the real essence of our faith. We don’t need people to point the way to God for us, we have Jesus who is God. The truth is no problem for the Christian; for Jesus is the Truth. It is the same for justice, mercy, kindness and any other attribute that we want to bring before God: they are all summed up in Jesus. So when Jesus says that we can trust in him, we can take it to be true. When he says that he has gone to prepare a place for us we can be sure that in heaven there is a wee seat sitting unoccupied with our name on it. What other faith gives a person so much hope as ours? In today’s reading from the Acts of the Apostles, we have a long speech given by Paul in the synagogue in the city of Antioch. The speech is interesting for a couple of reasons. Firstly, Paul gives a great overview of the salvation of the people of Israel from the time of the patriarchs right down to Jesus. In one paragraph he mentions all the major players and events. However, without explicitly saying so, Paul tells us something else about God that we seldom here spoken of, God as a builder of a nation. In modern times, the whole emphasis has been upon the individual and individual morality. But for many centuries the people understood that they stood before God as a community and that the community itself was built by God. This is the reason that the Church has always worked upon the parish structure, with each group of parishes under the authority of a bishop. We do not come to God as individuals, we come as a community which is itself based on the family structure. God builds up the community, his house is the centre of the believing community and the priest is the ‘father’ of the local faith community. Family is the nature of God, the Trinity is not a reflection of the family; the family is a reflection of the Trinity. The whole secular emphasis on ‘individual’ morality is so destructive because it removes God from the centre of a nation’s life. Until we can re-establish the central authority of God in the land we are always going to be under the yoke of secularism. 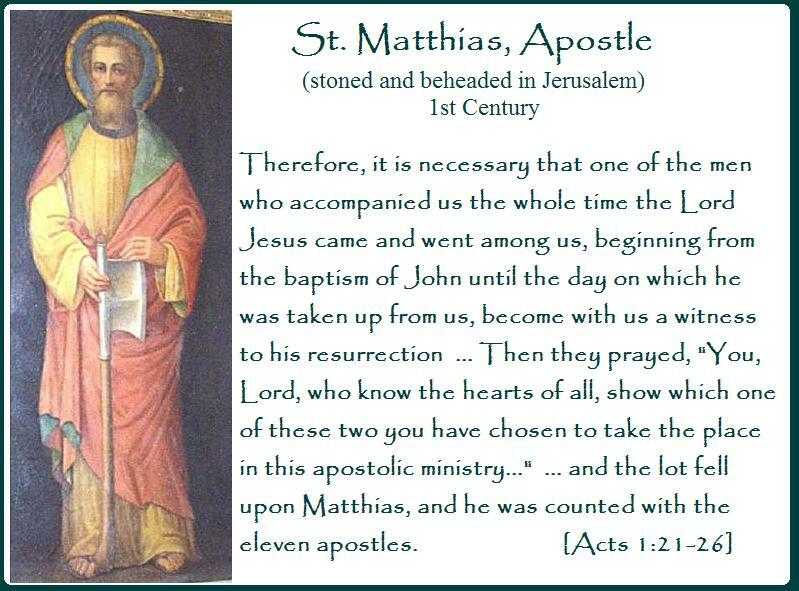 After the death of Judas and the new beginning of the Church with the descent of the Holy Spirit, the apostles realized that they had to replace the man who had died. This is important because if the apostles had not understood that they had to continue the succession of leaders, then the church would have died out after the first generation. So, what was the job description for the post of apostle? The big point here is that the new apostle has to be a witness to the resurrection. How do we experience the resurrection? If we are to understand resurrection then we must understand death. That is why the mystics say that we should die a little every day. Do I die to self desire, self will, self love, a little bit more every day of my life. I have to let go of my youth for it is gone forever. I have to let go of those I have loved and who have died, for they are gone from this life. But in the letting go of these things God works in our lives to make life new for us. We no longer hanker after the vigour of youth but become content with the restrictions of getting older; we know our loved ones are with Jesus and we become content that we shall see them again. For the Christian, every day should be a day of little deaths and resurrections, all working together to prepare us for the big death and resurrection that shall come to us all. Our priest said an interesting thing at Mass this morning. He said that it was very revealing that Our Lady appeared at both Fatima and Lourdes to children and that this was probably because children in their innocence have the ability to see what is behind the image. This is something we lose as we get older and more sophisticated. 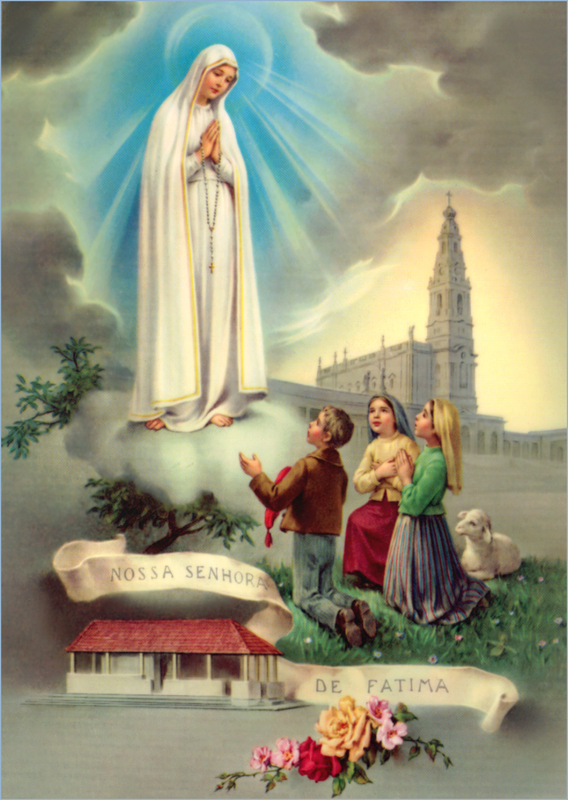 Mary appeared to three children, Lucia, Jacinta and Francisco at Fatima, a small town in Portugal in 1917. “The three children who received the apparitions had been brought up in an atmosphere of genuine piety: Lucia dos Santos (ten years old) and her two younger cousins, Francisco and Jacinta. Together they tended the sheep and, with Lucy in charge, would often pray the Rosary kneeling in the open. In the summer of 1916 an Angel appeared to them several times and taught them a prayer to the Blessed Trinity. I read this piece on the Catholic Culture website and there is a full account of the story plus a beautiful photo of the children. I never knew that an angel appeared to the children before the apparition of Mary, but I suppose that it was fitting that they be prepared for such a momentous event. Mary asked for people to pray the rosary for sinners and for people to be converted. She also asks for works of penance in reparation for the sins of the world. The messages of Mary always appear simple; pray and repent, but in these few lines lie the whole Christian message. Popes Pius XII, Paul VI, John Paul II as well as Benedict have all visited the shrine at Fatima. Mary brings her message to the world in many ways, but it is always the same; pray for sinners, the world and for repentance.